A versatile finger food that kids will love. In a large bowl, combine all of the ingredients except the olive oil. Mix well. 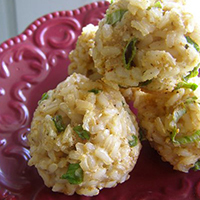 Using about 2 tablespoons of rice mixture at a time, roll into balls and line up on a baking sheet. Drizzle some olive oil over all of the rice balls. Bake at 325°F for 20 to 25 minutes until slightly browned and a little crispy.